Brand new for 2013, this book contains valuable information concerning male and female fertility, pregnancy, birth, baby, and up through toddler age, including addressing more than the common possible complications. "Parents and parents-to-be will embark on a journey unlike any other. It is a time of hope, anticipation, and joy -- so many emotions. It is a time of physical changes that potentially can be uncomfortable or result in complications. As family you focus on a perfect outcome, but occasionally encounter the unexpected. 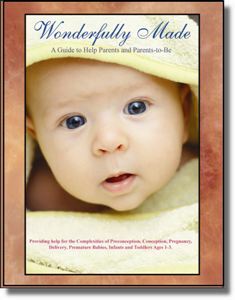 Wonderfully Made is a powerful tool to utilize as parents take this journey. The anatomy and physiology of pregnancy and childbirth are explained in clear and concise terms and illustrated beautifully. The incorporation of TKM® throughout this process is presented in a manner that is easy to understand and follow. Having worked as an RN for 20 years in a large Neonatal Intensive Care Unit, I have witnessed the healing powers of touch. I can recall doing everything to comfortably position a tiny infant to prevent apneas, bradycardias, and desaturations. It seemed that when I stood quietly by the isolette with my arms through the portholes and one hand cupping a tiny head and the other cupping a tiny bottom, the numbers on the monitor would improve the most. Little did I know that I was practicing TKM®. In many modern-day NICUâs parents are able to be at their infantâs bedside 24/7. It can certainly be a very complex and scary environment. The desire to somehow contribute to a positive outcome can be overwhelming. What better way for a parent to aid in the healing process of a tiny or sick infant than to practice TKM®. What better way for a parent to gain a sense of âIâm really helping my babyâ than to practice TKM®. What better way to give parents and caregivers the tools to provide the healing touch of TKM® throughout the journey of pregnancy, childbirth, and the early childhood years. The knowledge you gain from Wonderfully Made will give you the ability to contribute to the best possible outcome for you and your child."